Who becomes the 21st century equivalent of Ma Bell is anybody's bet right now. The current U.S. Internet telephony leader, Vonage Holdings Corp., launched in 2001 and says it has about 600,000 lines in service. But Vonage's advantage, a recently unleashed TV and online advertising blitz notwithstanding, may not last long. Among rivals nipping at its heels are cable TV and traditional phone companies that already have relationships with millions of consumers and are well positioned to bundle together TV, Internet access and telephony. "For a consumer getting a single bill and getting big discounts, that's a pretty compelling value proposition," said Zeus Kerravala, an analyst at the Yankee Group research firm. At the end of 2003, alternative voice providers like Vonage controlled 66 percent of U.S. Internet telephony subscribers, according to the Yankee Group. It predicts that by year's end, that percentage will drop to 19 percent, with cable operators at 56 percent and traditional phone companies at 25 percent. A big problem for Vonage and a host of other alternative providers such as 8x8 Inc.'s Packet8 and Primus Telecommunications Inc.'s Lingo is that they piggyback on home broadband connections controlled by other companies. Unless they strike a deal with broadband providers and others, they can't guarantee time-sensitive voice packets are given priority over other data, such as someone's illegal movie download. That could result in poor call quality. Cable TV operators and traditional phone companies control the wires into homes -- and often the network far beyond. In many cases, there's no need for voice traffic to ever move over what's considered the public Internet. On their private networks, companies can give voice packets priority. In fact, most analysts expect the big battle to be between existing cable TV and phone companies. Cable companies are hoping to swipe telco customers with voice services. Phone companies want to keep their existing companies and plan to offer TV over their networks. So far, phone companies appear to be at a disadvantage because their Internet offerings use DSL technology and it degrades the farther out from the central office. DSL also lacks the capacity of the cable industry's data pipes, though phone companies are beginning to roll out high-bandwidth fiber to residences. SBC Communications Inc., for instance, has run a VoIP trial for some DSL subscribers and plans to offer an interim service in the near future. But it's most advanced VoIP product won't arrive until its project to bring fast fiber networks closer to homes is farther along, said SBC spokesman Shawn Dainas. AT&T, which is expected to be acquired by SBC, already sells a nationwide VoIP service, CallVantage. It reported 53,000 subscribers at the end of last year and has set a goal of 1 million by year's end. But will the telcos be too late? Already, Cablevision Systems Corp., a New York-based cable operator, reported 270,000 voice customers. 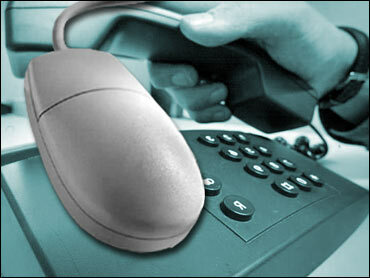 Time Warner Cable reports signing up more than 220,000 phone customers -- and adding 11,000 each week. And the nation's No. 1 cable provider, Comcast Corp., is just getting started. But by year's end, it expects to offer its digital phone service to 15 million homes. Voice packets will be given priority and traffic will be carried over Comcast's own network. "We don't touch the Internet here," said Rian Wren, Comcast's senior vice president of telephony. Ultimately, voice services will converge not only with computers but also with TVs, he said. In the next 18 months, you'll start to see prompts on your TV for processing e-mail, voicemail or incoming calls. Eventually, you'll be able to handle that communications right through your TV, Wren said. Digeo Inc.'s Moxi platform, available through such cable providers as Adelphia Communications Inc. and Charter Communications Inc., also is integrating telephony and television. And then there are the Internet providers. America Online Inc. is among those jumping on the Voice over Internet bandwagon, debuting service in 40 markets last week. Jonathan Miller, AOL's chief executive, says that while barriers to entry are extremely low in this business, the non-techie customers embracing it won't be so forgiving. "They just want something that works -- a trusted source at a good price,'' he said.